Women the epitome of everything God ever envisioned and created. A world just, fair and equal. A world where opportunities, knowledge and seeking is democratic and from this very utopian concept emerges like germination of an embryo another thought that today has been nurtured into a giant called Vedantu. What if I tell you that there truly is a place which is the very shrine of equality, justice and free knowledge. A place where the seeker has to seek no more and a place of true redemption for all those who come to its sacred hallows. Vedantu stands by its founding principle that there should be a “level playing field” and that no child should ever feel geographically or monetarily challenged. The only quest should be of knowledge and there should be no other restrictions. It is the perfect Amalgamation of someone in quest with an ocean of knowledge on the sublime banks of trust, faith and hope. Not only has it proved itself time and again on this principle but over the years it in turn become a pious sanctum for women. This women’s day let me shed some light on it. It is extremely unfortunate that in a county like ours which is the seat of the Upanishad’s and Vedas, the source of our name as well. Today we have come to an era where women often live under fear and prejudice. This is one organisation which has strengthened every woman who has ever reached out to us. Be it Mehreen from Anantnag in Kashmir who is often left stuck in her home in knee deep snow or Khunsa who has restrictions for moving out after certain time. Be it Susan who has changed her name and given herself a new identity online to come to grips with her life or Girija who has Vedantu as her lifeline. Be it Anjali who rushes home after classes at 7 so that she doesn’t miss a minute or be it Reem from Dubai who matches her school and sports to not miss a day at Vedantu. Be it a young bride a young mother, a single mother or a defense spouse whose husband is always posted to Far flung areas in service of the nation. Be it Simriti who was a student of Vedantu’s founders and is a integral part of team Vedantu now. Not only has Vedantu stood behind each one of them as a rock making sure it enables and empowers them. It also fills each one of them and countless others with a sense of purpose, with dreams and the strength to conquer them. 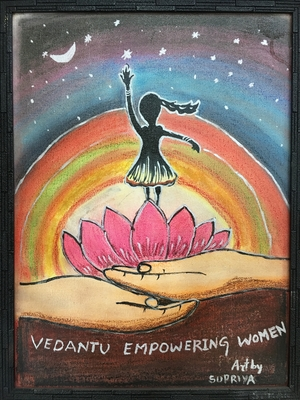 Vedantu has been the wind beneath each of these young girls and women’s wings. It has made them flutter and reach for the skies and yet when it gets chilly and cold its only Vedantu who cocoons them. Each girl can be safe and sound in the comfort of her home and yet dreams of achieving the universe. This proves that no one has ever given up on their dream just because they are in a far-flung area in Indo Burma border or the icy heights of Kashmir. It makes women believe and give’s purpose and passion to their lives. This is one idea which truly is touching countless lives and making women rise and shine. Celebrating not only the bond of womanhood but the beauty that Vedantu is and cherishing every moment of it. #All names and information are absolutely true.